In the 80 years since the Gropper Dairy was founded in 1929, the family-run business has succeeded in becoming a leading German filler of fresh dairy products. In addition to distributing its own brand, Gropper has used a strategy of investment and innovation to drive growth in the areas of private labels and co-packing. Based on extensive experience in product development, the Gropper Dairy is today able to offer superb quality coupled with high flexibility and optimal technical conditions. Gropper works in close cooperation with well-known producers of brand products as well as with national and international discounters, providing them with a full range of services. The company has about 370 employees and currently processes approximately 150 million kilograms of milk annually. Products are filled into containers with diameters of 75 mm or 95 mm, as well as various sizes of gable top cartons and PET bottles. The sensors for filling level measurement and overfill protection originally installed in the filling machine were replaced by sensors from Negele Messtechnik. Monitoring in the seven dosing chambers is now performed by continuous level sensors of type NSK-187 (Fig. 1 and 3). These sensors not only achieve short measurement and evaluation times, they also off er very high precision, even at low filling levels. The sensors work independently of the medium being measured, delivering precise results even in pasty, adhesive materials (such as fruit additives) and in foaming media. Because they do not need to be calibrated, they can be applied very flexibly in the production plant. In addition, they are highly durable, resisting both the media in which they are immersed and the rapid and frequent temperature changes that occur during CIP/SIP. 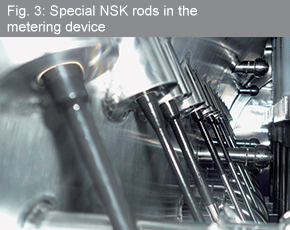 NSK level sensors are designed with the electrode rod separate from the electronics. 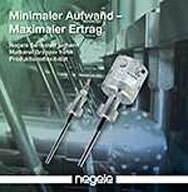 This greatly simplified the task of retrofitting the NSK level sensors into the plant. It was possible to mount the components in a way that made the best possible use of the available space. Upon customer request, tag-number labels were permanently applied to the individual sensors (VA material with permanent laser lettering), making it possible to identify and document the individual measurement locations. 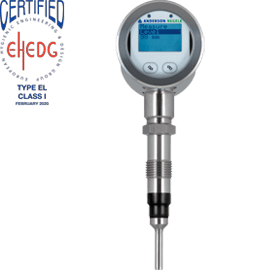 To provide a redundant safety mechanism when filling the metering device, reliable conductive limit indicators of type NVS-186 (Fig. 2 and 4) were installed in the plant for overfill protection. 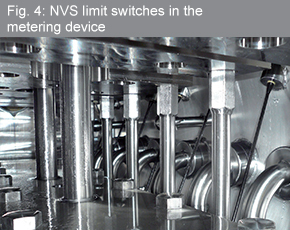 These operate independently from the filling level sensors and are mounted opposite to the NSKs in the metering device chamber.Negele‘s flexibility both in terms of design and production made it possible to retrofit the sensors using the existing connectors of the previous electronics, saving time-intensive and costly modifications of the process connections and the plant. We are pleased that the Gropper Dairy trusts in Negele measuring equipment to help achieve their high production flexibility and quality standards.